Amy eagerly joined the F&F team September 2002 leaving an accounts payable position at a dealership. She wanted to contribute to a more personalized team and make a difference as an employee. She is a trustworthy employee who runs the office administration and enables Amy, the owner, to focus on other tasks. Her daily routine includes greeting customers and writing up their repair orders, general bookkeeping such as accounts payable and receivable, reviewing repair invoices with customers to make sure they understand the repairs performed, and closing the daily books. In addition, Amy takes the initiative to organize completed jobs and prepares them for customer pick up. This has made a tremendous difference in the flow of our organization. She has a "bubbly" and friendly personality which warms up customers and makes them comfortable. She is genuinely caring and concerned about our customers receiving the service they deserve. She shows up to work everyday with a smile on her face. 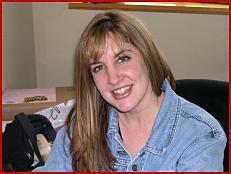 Amy worked at Evergreen Ford's Auto Body Shop as an estimator and office manager. She likes the positive atmosphere at an independent repair shop and feels that their customers get real value for their dollar. Amy has expressed an interest in taking automotive related courses to increase her technical knowledge. Amy and Ed are delighted to assist her in this effort. Amy enjoys rock-n-roll music and is an avid Sammy Hagar fan. In fact, her two Persian cats are named, Sammy and Hagar! Amy enjoys boating and snowmobiling with her husband, Tom. She also likes to play golf or go bowling with her friends. *With two Amy's in the shop it was necessary to give one a nickname. Think Austin Powers.